Description This game is a remake of the classic asteroids game. 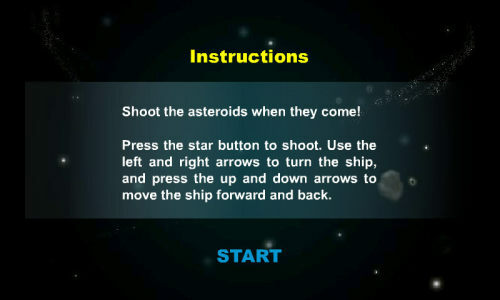 In this game you control a space ship to destroy the asteroids. The asteroids may not be destroyed by one shot, instead they will be broken into smaller and smaller pieces until they are finally destroyed. If your ship is hit by the asteroids or the fragments of them, your ship will be destroyed and the game is over. Occasionally there will be UFO's approaching and they will shoot your ship! Destroy them and get extra bonuses! Controls Shoot the asteroids when they come! Press the space bar to shoot. Use the left and right arrow keys to turn the ship, press the up and down arrow keys to move the ship forward.